High on Pinon Mesa, tucked alongside a draw, surrounded by aspen and spruce trees and a carpet of mountain grass and wildflowers sits Harold Bryant’s cabin. Bryant, a local artist who became nationally known as the “painter of horses,” purchased the cabin and 41 acres in 1926. Bryan was an intensely private man, and after a visit to the cabin and surrounding area, it is clear that he had the seclusion he needed and enjoyed. The landscape around the cabin leaves no doubt that it was at this cabin where he got the inspiration to paint many of his 85 canvases. The cabin was built in 1911 by P.A. Rice, an early Piñon Mesa sawmill operator. His son, Phidelah Rice, a well-known actor of the time and owner of Rice Playhouse at Martha’s Vineyard, Mass., used it as a summer home. It is a fairly large cabin with a wraparound porch, L-shaped living/dining room with hardwood floors, fireplace, and kitchen and bathroom with running water. Upstairs is a bedroom. Bryant used a room off the living room for his studio. At one time the newel post on the inside stairway had many brands carved into it. The post was removed and replaced with another post by some unknown person. Bryant was born in Nebraska and moved to Appleton with his family in 1903. He went to Appleton grade school and was in the first graduating class from Appleton High School in 1914. From the time he was a young child he was drawing and studying the out-of-doors, horses, cattle and cowboys. Bryant had purchased his art supplies from C.H. Robinson, owner of Wallpaper & Paints, 337 Main St. Robinson, who was himself an artist, recognized Bryant’s talent and sent several of the youth’s sketches to the Chicago Art Institute, where Bryant was accepted as a student. Bryant studied at the institute until 1917 when he was drafted into World War I. He served with the 89th Division, 341st Field Artillery Band as a saxophonist. After two years overseas he returned to Chicago, where he did commercial artwork. He later went to New York, where he had a studio, and continued working in commercial art for various publications. Soon Bryant was making a lucrative income and investing it. Then the 1929 “crash” happened, and Bryant found himself as broke as when he first moved to Chicago to attend art school. He stayed on in New York and eventually was making money again, but it was in commercial art, and he wanted to paint Western life as he saw it, not as a New Yorker saw it. That was about the time that his future wife, Ruth, came into his life. She knew that Bryant wasn’t happy doing commercial art. She knew he wanted to paint horses, cowboys and cattle, and that he wanted to paint the West that he loved. While Bryant was back home in the West, Ruth and his sister, Dorothy, acted as agents. 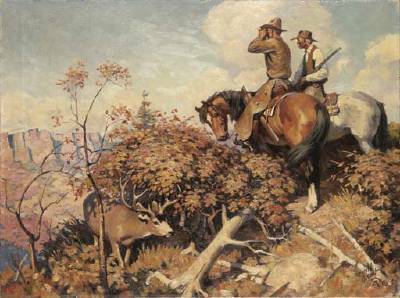 To pay the bills Bryant did illustrations for magazines, including The Rocky Mountain Sportsman and Capper, and paintings for calendars. He remained church-mouse poor. The turning point for Bryant came in 1941 when Art Merrill, a friend from Taos, N.M., took Bryant’s “Disputed Brands” to show the manager of Grand Central Art Gallery in New York. The manager requested more canvases, and Bryant’s paintings began selling for $1,000, making him a nationally recognized Western artist. Life was good. Bryant, an avid hunter, missed few opening days of hunting season. But in November 1948, too ill to go hunting, Bryant stayed home and began work on “Opening Day,” a hunter dismounting to shoot elk. After the painting was finished he looked at the picture, and decided it was good and not for sale. He put it in storage. Bryant believed, as do the Navajo, that when you have created something that is perfect, your work on Earth is done. Around Christmas 1949 he had Ruth bring “Opening Day” out of storage. He looked at it and said “It is perfect,” according to his biographers. A few weeks later, his work on Earth apparently done, Harold Bryant died Jan. 19, 1950. Eleven of Bryant’s paintings are in the permanent collection at The Art Center, 1803 N. Seventh St. Call for information about when some of the Bryant collection will be on display, 243-7337. More of Kathy Jordan's stories about local history can be found in the Daily Sentinel. "The Strategy of the Wild"
Artwork images are copyright of the artist or assignee. Build your own mountain retreat quick and easy! Click here to Learn How To Build a Container Home!